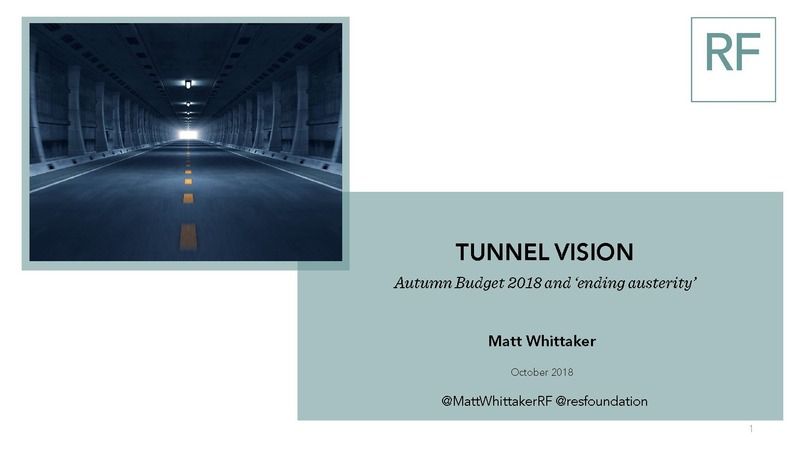 In this briefing paper we explore the challenge facing the Chancellor in this year’s Budget: balancing the seemingly conflicting goals of ‘ending austerity’ and lowering debt as a share of GDP. The former comes with a price tag, while the latter precludes the option of meeting that cost simply through extra borrowing. With so much uncertainty around, and an ongoing determination to lower debt relative to GDP, the Chancellor will want to follow a more modest borrowing path. To square the circle, he will almost certainly need to raise some tax revenues, even if not at this Budget. A combination of cancelling the corporation tax cut from 19% to 17% in 2020 (raising £6bn) and re-introducing fiscal drag to the income tax system by freezing the main tax thresholds at £12,500 and £50,000 after 2020 (raising £2.5bn) could raise in the region of £8.5bn by the end of the parliament. These taxes have the best chance of being implemented without widespread controversy or rebellion.